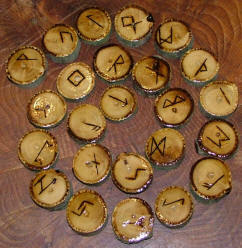 The runes are a set of symbols which are inscribed onto small discs which are usually made from wood, stone or crystals. They are often stored in a bag and a person will randomly pick out a certain number of the runes whilst focussing on an issue or question. Runic symbols can also be used to magickally empower an object or spell, for example they can be added to talismans to draw particular energies to the carrier or engraved onto candles prior to spellworking. More information on the meanings of the runic symbols can be found here. Spirit of Old rune sets are handcrafted to a very high standard and are sent complete with a drawstring cotton bag for storage. This beautiful rune set contains the full 24 Elder Futhark runes and is crafted from Oak wood. Each rune has been carefully handcrafted and varnished. Supplied with a simple cotton drawstring bag. The rune sets shown below are sold and are left simply as a portfolio of previous work. New runes will be crafted in the future and when new items are available they will be shown on our Facebook and Twitter pages. If you choose to "like or follow" a page you'll be automatically updated. 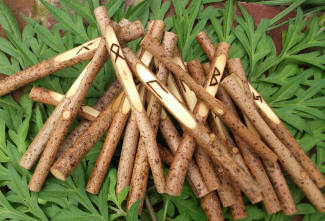 This large rune set contains the full 33 Anglo-Saxon runes and is crafted from beautifully natural hazel wood. The wood was carefully and respectfully gathered from the land surrounding the ancient, sacred site of Stonehenge in southern Britain. Supplied with a cotton drawstring bag for storage. This large rune set contains the full 24 Elder Futhark runes and is crafted from beautifully warm-coloured ancestral yew wood, carefully and respectfully gathered from an ancient barrow. This beautiful set of rune staves contains the 24 Elder Futhark runes and is crafted from the wood of the wayfaring tree. The wood was respectfully gathered from the site of an ancient barrow. The staves are supplied with a simple cotton drawstring bag for storage. This naturally shaped rune set contains the full 24 Elder Futhark runes and is crafted from beautifully natural oak wood. The Druids have long held Oak to be a sacred tree and the Oak's ogham name of "Duir" has links with the origin of the word "door". The oak was seen as a doorway to the Otherworld. This beautiful set of rune staves contains the 24 Elder Futhark runes and is crafted from the wood of the wayfaring tree. The staves are supplied with a simple cotton drawstring bag for storage. This naturally shaped rune set contains the 24 Elder Futhark runes and is crafted from English oak wood. The box has been crafted in a completely traditional way from ash bark. The join is bound with cedar root and birch tar glue, made in the same way it was in prehistory. The base of the box is yew wood and it is finished with a lid of ancient English bog oak. This large, naturally shaped rune set contains the full 24 Elder Futhark runes and is crafted from beautifully grained yew wood which is from Ireland. In the Celtic past the tribal elders and leaders were buried under Yews in the belief that the tree would keep their knowledge and wisdom available for the future use of the tribe. The Yew represents direct contact with our past, and the old wisdom which we find deep within ourselves. This rune set contains the full 24 Elder Futhark runes and is crafted from ancient bog oak. The wood is from the Norfolk Fens, home of the historic Iceni tribe and their infamous queen, Boudicca. This beautifully dark wood is dated to the British Iron Age, around 2,300 years ago and feels full of positive energies. Supplied with a cotton drawstring bag for storage. This naturally shaped rune set contains the full 24 Elder Futhark runes and is crafted from beautifully grained yew wood which was gathered from near to a round barrow, full of ancestral spirit. This wonderful rune set contains the full 24 Elder Futhark runes and has been crafted from hazel wood which was respectfully gathered from close to the ancient, sacred site of Stonehenge in southern Britain. This rune set contains the full 24 Elder Futhark runes and is crafted from ancient, dark bog oak which is around 3,000 years old. 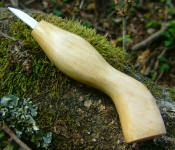 The wood is from Ireland and feels full of positive energies. This wonderful rune set contains the full 24 Elder Futhark runes and has been crafted from hazel wood which has the outer bark left intact as a contrast to the inner wood. This rune set contains the full 24 Elder Futhark runes and is crafted from ancient bog oak. The wood is from the Norfolk Fens, home of the historic Iceni tribe and their infamous queen, Boudicca. This beautifully dark wood is dated to the British Iron Age, around 2,300 years ago and feels full of positive energies. This large and chunky, naturally shaped rune set contains the full 24 Elder Futhark runes and is crafted from beautifully grained oak wood which was gathered from a round barrow, full of ancestral spirit. This large, naturally shaped rune set contains the full 24 Elder Futhark runes and is crafted from oak, ash and thorn (hawthorn) woods - the traditional three trees of the Fae folk. The rune pieces of Freyr's aett are made from the feminine and fertile hawthorn, Hagal's aett is made from ash and lastly, Tyr's aett is made from the strong and heroic oak. This large, naturally shaped rune set contains the full 24 Elder Futhark runes and is crafted from beautifully natural oak wood. The pieces are large, chunky and tactile and will make an excellent set to work with, particularly in a group setting. For a more visual idea of the overall size and size variation of the rune pieces, please see the bottom right thumbnail. This naturally shaped rune set contains the full 24 Elder Futhark runes and is crafted from hazel wood which was respectfully gathered from near to the ancient, sacred site of Stonehenge in southern Britain. This large, naturally shaped rune set contains the full 24 Elder Futhark runes and is crafted from beautifully grained yew wood which was gathered from a round barrow, full of ancestral spirit. This naturally shaped rune set contains the full 24 Elder Futhark runes and is crafted from beautifully grained oak wood, some of which features natural pentagrams in the centre. The pentagrams are most visible in the bottom left thumbnail - please use your browser's "back" button to return to this page. This naturally shaped rune set contains the full 24 Elder Futhark runes and is crafted from hazel wood which was gathered next to the ancient, sacred site of Stonehenge in southern Britain. This naturally shaped rune set contains the full 24 Elder Futhark runes and is crafted from beautifully grained oak wood which has distinctive markings. The pieces are large, chunky and tactile and will make an excellent set to work with. This naturally shaped Hylde-Moer rune set contains the full 24 Elder Futhark runes and is crafted from elder wood. The Hylde-Moer comes from English and Scandinavian folklore and is the Elder Mother or dryad that inhabits the elder tree. The Elder Mother is the guardian of the elder trees, and folklore in England and Scandinavia says that for a person to take wood from the elder tree they have to ask the Elder Mother first, otherwise they would incur her wrath. These elder "Moer" runes are made from elder gathered in the correct manner, from the revered Itchen springs site in Hampshire, southern Britain. This naturally shaped rune set contains the full 24 Elder Futhark runes and is crafted from beautifully grained oak wood which has distinctive markings. This large, naturally shaped rune set contains the full 24 Elder Futhark runes and is crafted from beautifully grained oak wood which has distinctive markings. The pieces are chunky and tactile and will make an excellent set to work with. This beautiful rune set contains the full 24 Elder Futhark runes and is crafted using wood from a wayfaring tree in a copse close to Stonehenge. The runes are stored within an ash bark box. 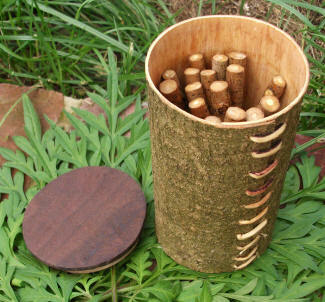 Bark has been used by many cultures throughout time to make containers and this box has been crafted with natural materials including cedar root which is used to sew the join.